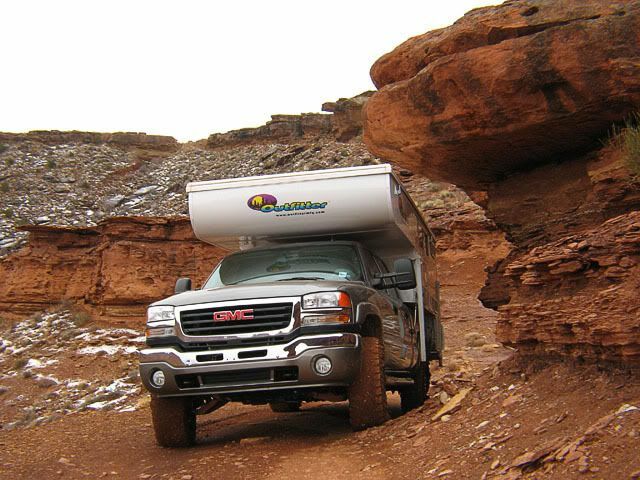 I'm new here and not sure who might be interested in a trip report, but since this was our first time 4wheel trip with a camper I thought someone might like to know how it is. And the word is slow. And sometimes a wee bit spooky. We have a bone stock Jimmy 2500HD with a pop-up Outfitter Apex 8 camper (oh yeah) with Hypertech being the only upgrade at this point. Well ok, tires, wheels, air bags and front level kit but don't we all. Having 4 wheeled as much as anybody I was curious about the new automatic rear locker. The front diff is open but I didn't buy this rig and camper to get into trouble, just to camp comfortably in the boondocks where I used to tent camp. Little did I know how much trouble I'd be having. 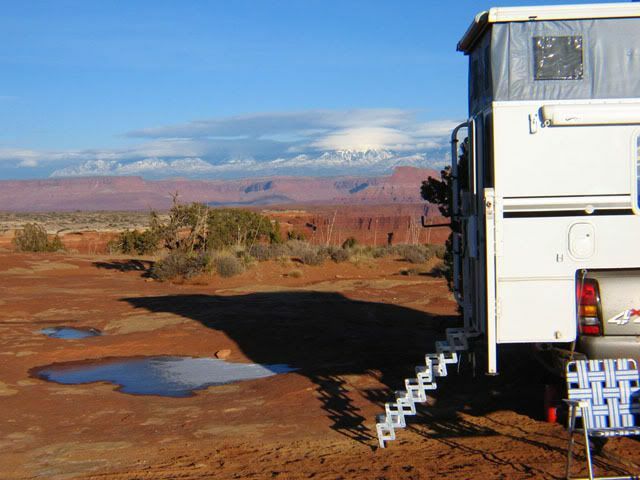 My wife and I started out at Island In The Sky near Moab, Utah. 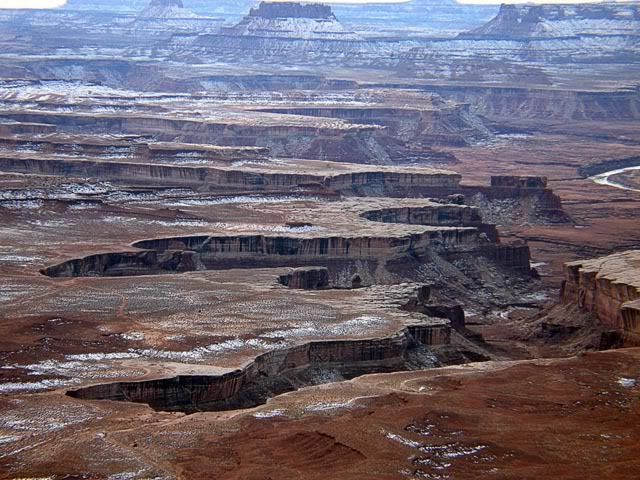 And it seemed from every vantage point we could see the White Rim Road below, and it always looked flat, smooth and dry. (Except for a bit of snow here and there.) We'd soon find out the real truth. I'm thinking that's why we never saw a Dodge or Ford, just our manly, macho and highly capable Jimmy diesel. Every thing was nice and tight except for a loose nut behind the wheel. We could also see the Colorado River was full of ice, something I had not seen before. Maybe that's why my bald spot froze the first night out, it wouldn't fit under the sleeping bag. 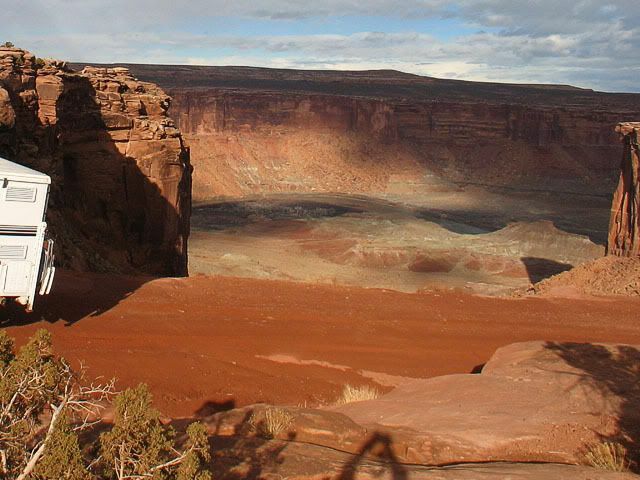 So having picked up a permit and finding out that we'd be THE only ones on the hundred mile 4wheel road we headed back to Moab to start from the Potash Road entry as the Shaffer Trail entry from Island In The Sky was closed. The Rangers also recommend a clockwise travel and now I know why. So the first 50 miles there was no 4wheel needed and except for a very rough and rocky road it was totally scenic, slow and uneventful and I was thinking that the Man-truck would not get a workout. Our first stop was at Musselman Arch, a very neat place to walk out on if you haven't had an early toddy. A mis-step here and you'd see the arch from a couple hundred feet below...or not. Then it was back on the road for more scenery. I've heard it said that Dodge and Fords are afraid of heights so I can't recommend driving too close to the edge as in a GMC. On the way to The White Crack camp we passed Monument Basin. 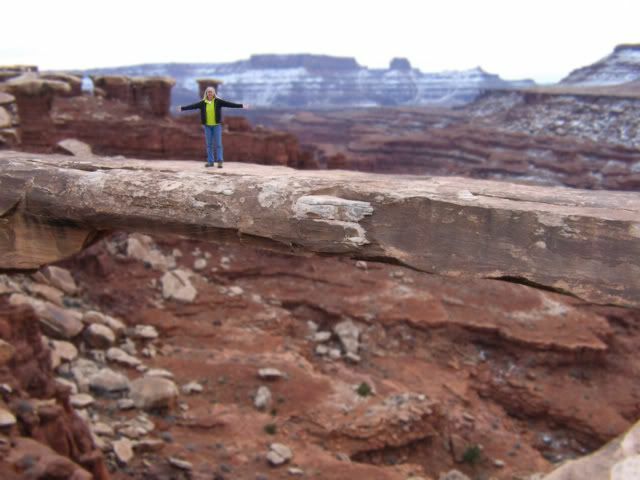 A very scenic area below the actual White Rim. There is also some occasional wildlife "outside" the truck. So late afternoon at White Crack camp and the weather is great and no sign of the "slight" chance of rain and as of yet no water or mud on the road. 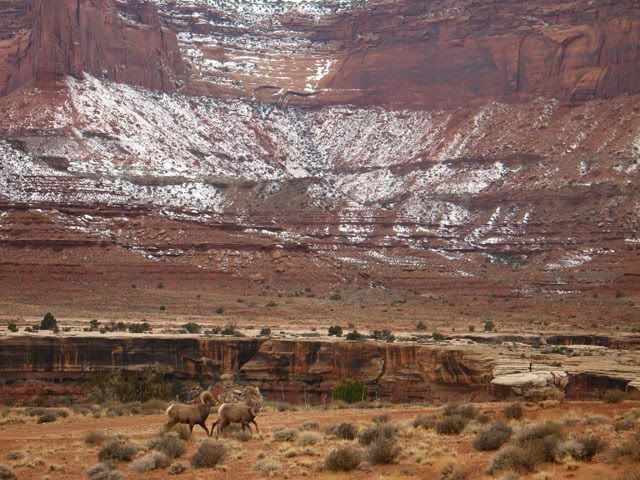 And the views of the La Sal Mountains are awesome! 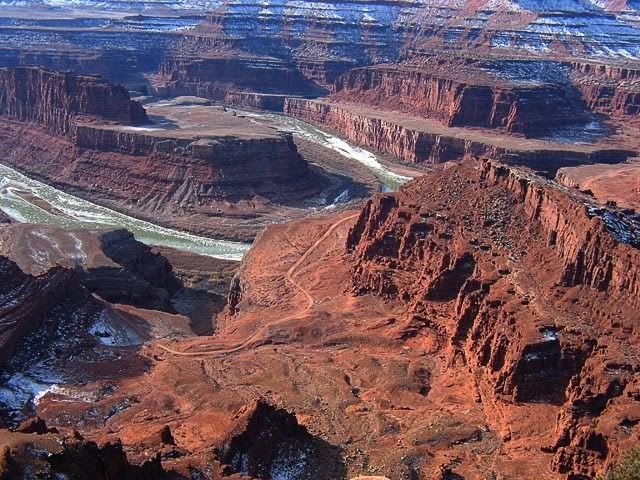 There is a trail that needs to be looked for that leads 6 miles to the Colorado River and an old mining operation complete with an airfield. While looking down at the old jeep road in the canyons and wondering at the nerve those guys must have had to drive it, you just know they were in a very old vintage Jimmy 4x4. Ok, probably a Willys. So at the top of the Hogsback much celebrating. Only to discover a quarter mile farther we had to go...down the backside. We had thought to be on another level with the road but nooo. Not to be. Here's were the mud, ice and totally saturated road started. My wife walked again...with the camera. Then at the bottom finally there was another suprise. An overhang that God made to just clear my Outfitter. So at this point the road has made a dramatic change. 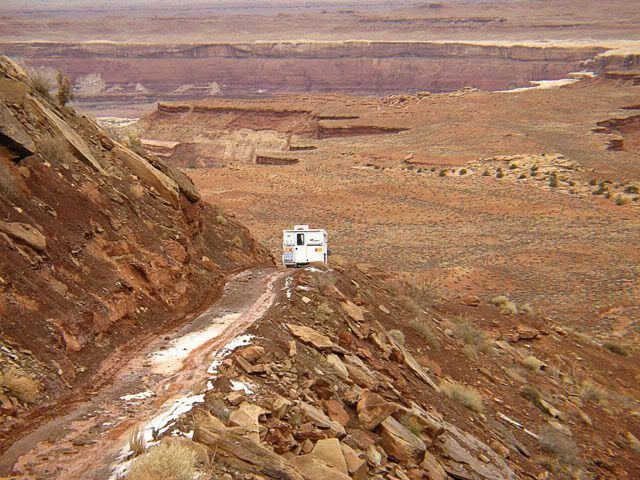 We are now in the foothills of the Island In The Sky Mesas and at this point the road is not flat. The dirt has been saturated by snow melt and is so soft it breaks away as we make even the smallest off-camber turn threatening to slide us sideways into the small gullies. At this point I am even remembering and using my road-building lessons and searching for rocks that were everywhere on the first 50 miles. Now only mud! At this point we are scouring the small brochure given by the Park Rangers for road info. It mentions something about not trying Hardscrabble Hill after a rain. Crap...it sure looks like rain to us. So instead of stopping for the night at Potato Bottom Camp before "The Hill" it is still light out and we go for Hardscrabble in case it rains in the night. As we approach Hardscrabble we notice the road has been graded and we feel great. As we head up the steep, very tight and DRY hill we are confident. At one point you have to make a multi-point turn to continue up as the turn is too tight. You are now climbing above the Green River. Soon we come to a very narrow point that you cannot see around and pull the mirror in to make. Later, I would wish to have stopped and tried backing up here. The bummer of 4wheeling with a camper is lack of visibility in the side mirrors and a little extra width. Rounding that corner we were met with a fully mudded out, narrow road with a cliff drop on driver side and cliff face on the passenger side with about 2 inches to spare. There was no way to go back and it was the third time my wife would walk. I gave her the phone to carry. LOL Wish she had the camera instead. Once moving I couldn't stop for fear of being glued to the mud. There was the real possibility of sliding off the road for about a half a mile so let it be known that plastic underwear with elastic around the legs is a wonderful thing! Later my wife would say how much better she felt being behind me walking as I looked to her to be in total control. HA! Never did I feel so out of control and at one point only did I have to get on the gas to prevent a possible catastrophe. Otherwise the wonder truck that I am proud to own crawled at a snails pace and even with packed tread was able to deliver us to the next camp. My wife did also say that while walking she was on hard mud and not the stuff I felt to be sliding in. I have no doubt the weight of the camper saved us as it pushed me down to hardpack. The real problem was making even the slightest turn as the front wheels would not turn but only push mud. I found that by letting the wheels roll without gas or brake worked the best. And it was on this hill that I realized the wisdom of clockwise travel. 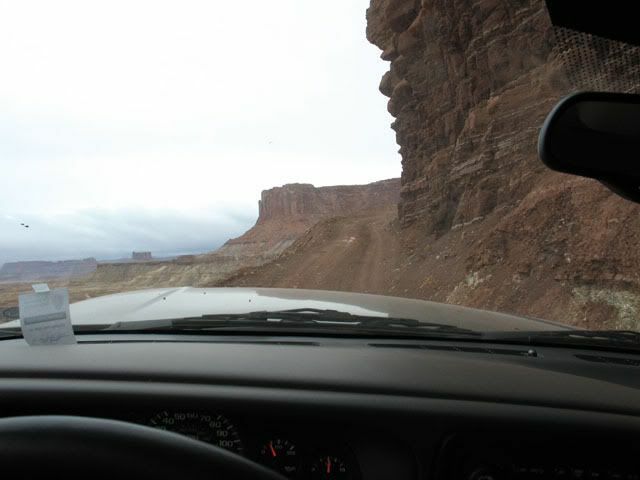 The driver side is the cliff side and while being spooky at least you can better judge how close you are to the edge. Just have to keep the imagination from seeing the road break away from under the front wheel. 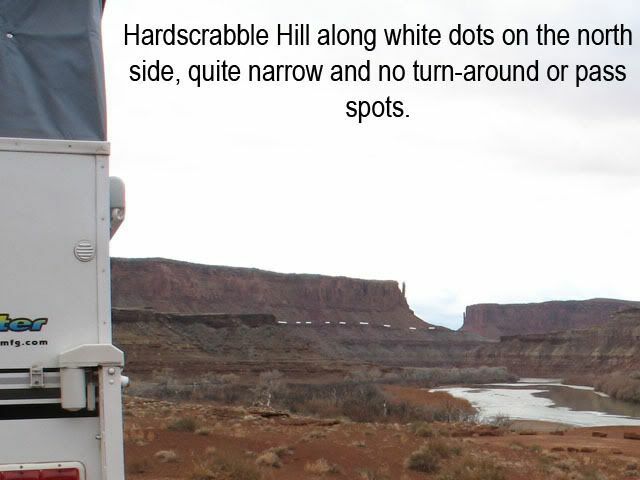 From our next camp we could see the ridge that Hardscrabble followed but not the actual road itself. Quite spooky and I wonder who drives the grader for that road. That guy doesn't need plastic underwear. Gotta have nerves of steel for sure. So, much celebrating at camp until my wife read about the Mineral Bottom switchbacks. Uh huh, more to come. So at this point we didn't sleep well worrying about the next day and of course the real possibility of having to go back the way we had just come. They climb about one thousand feet in a mile and a half. We were sure it would have mud. First thing in the morning of course the road jumped to some more cliffs and after coffee you could have played us both like a guitar we were strung so tight. 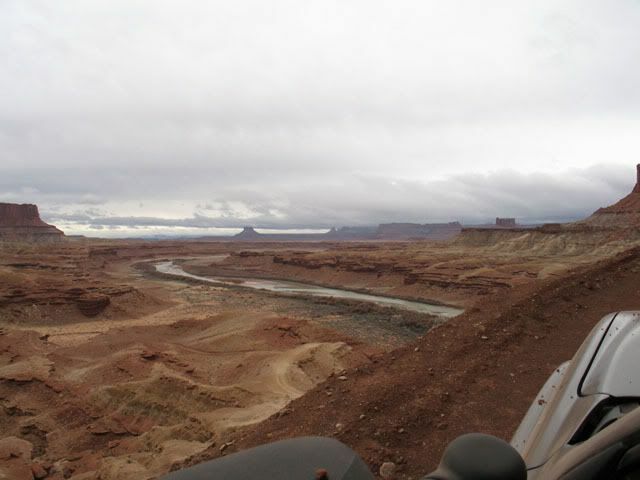 Soon after the road leaves river level and climbs into a side gorge. At this point came the famous question of "Where the heck is the road?" It goes into the thousand foot cliff face at the bottom and disappears.It takes getting right to that point to discover "the switchbacks." Good Lord I can't imagine coming down them and am glad to be going up. At least in the mud (yes there was mud and ice) I won't be hitting the brakes, but will be again in 4 low doing the crawl. At the top...much celebrating. Only to discover 13 miles of nice wide, flat and very muddy road out to the highway. Dave, I'm not a truck camper, but I can say WOW!!! This looks like I might want to try in warmer weather with my Jeep and a tent. Do you have a site with more pics? Great pictures. The next time my wife opens the door to walk after she says WE can make it I will tell her to take the camera! Hey there rv2go, I apologize I don't have a site but have a space on Webshots I think, that I've never used. I'll see if I can put some pix up in the next day or so if you like or I can e-mail a few. A jeep would be superb and I'm sure you'd love it. 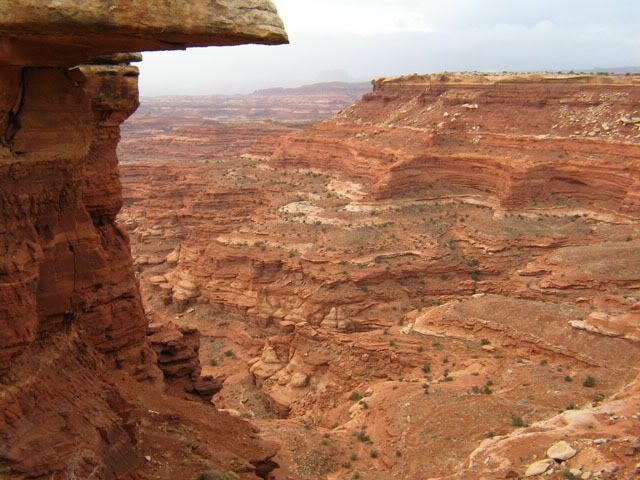 There is another trail called the Lathrop Trail off the White Rim Road that we didn't do but I've heard it's a good jeep trail down to the Colorado River. You can PM me if you like for more info. Dave you write a very good travel documentary, followed you journey/journal each and ever every step of the way. Looking forward to the sequel, something like, "How we, Dave Roberts, and that Camera gal, and my trusty 4x4(GMC), got to camp at the top of Mt. Everest" . Searious I am primary a water person, but that, those, views & pictures I might add, were something terrific!!! Thanks for making it back in order to share. 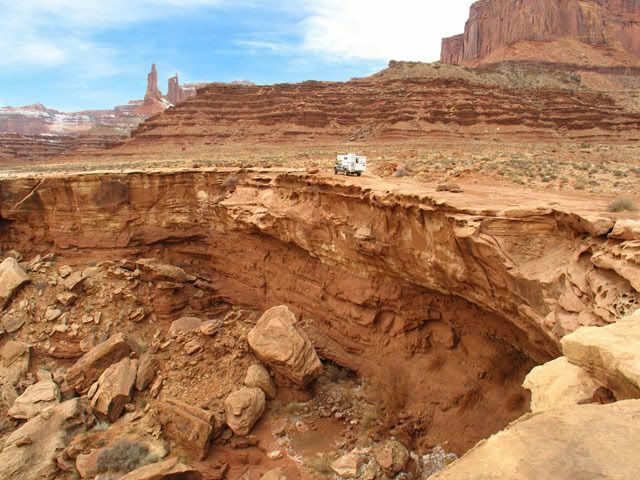 Question Dave: Were you as the driver, able to look-up at all, in order to take you eyes off those mule paths? Love it, thank you for the story. Great Adventure. Glad you made it without any mishap.... thanks for the pics and story. 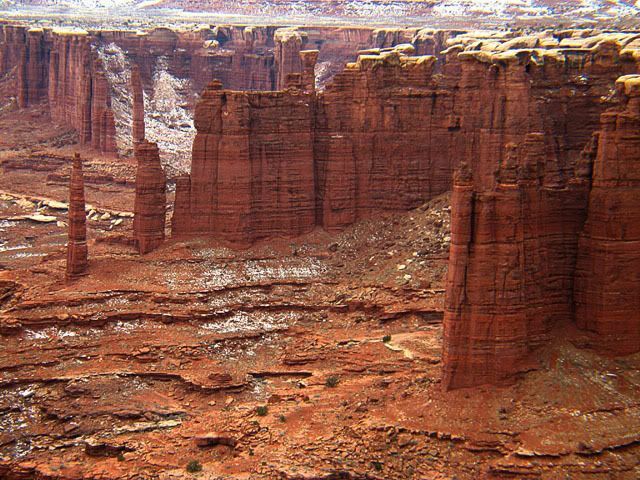 Way to go Whazoo, I've been doing some research on the White Rim Trail for our trip to Canyonlands this coming June. 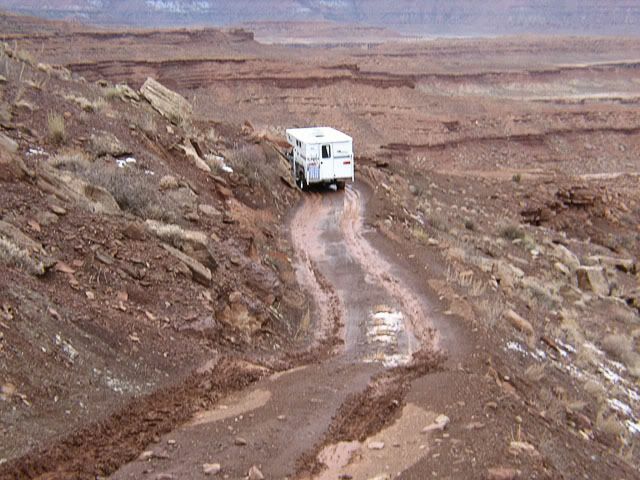 Your's is the only recent posted report of a TC doing this trail,the only other posted report I could find of a RV doing this trail is by Earthroamer. Great pictures this gives me a better idea of what this trail is like. As a local in the area, I can state unequivocally that Dave deserves a lot of credit for getting through this 4x4 trail in one piece based on the conditions he encountered. 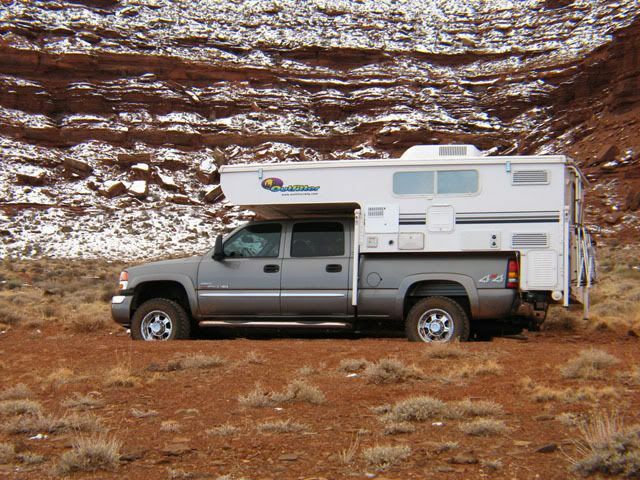 With a full-sized pickup and a camper, this trek is challenging enough in good weather with dry roads. 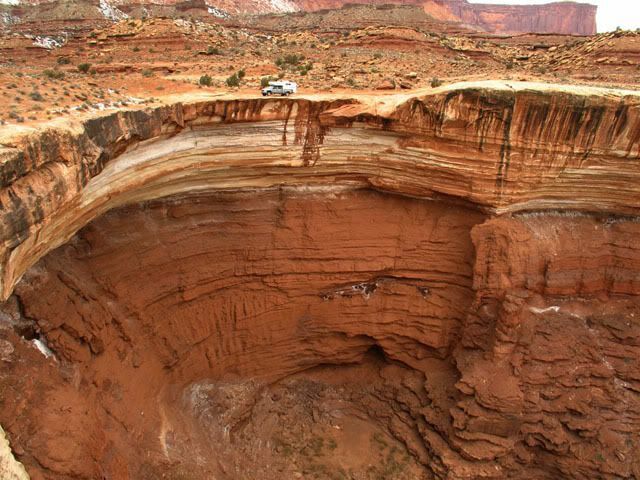 However, Utah in general (and especially southern Utah), has experienced one of the wettest Decembers in history, and January has been about the same. You can get into some pretty nasty mud even after a single storm cell dumps rain in a localized area (due to the clay & shale content), but the roads and 4x4 trails in this part of the state have been simply super-saturated, so the mud that Dave and his wife encountered must have been truly off-the-wall. I have traversed this trail over the years in small, modified 4x4 vehicles, but I wouldn't want to have even done that with this type of mud. 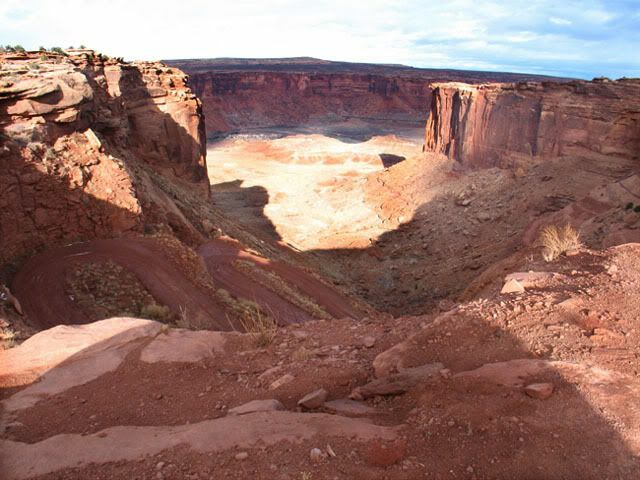 Hopefully, when Steve and I do this trail in mid-March with our trucks and campers, the mud will be gone (other than possibly some ruts left by Dave and his "manly, macho and highly capable Jimmy diesel"). Great pics and write-up Dave.